“It’s really hard to trust yourself in general,” said Allison Sage, a U.S. Army National Guard Veteran. She says it’s especially hard when you feel like you have a story that no one wants to hear. That community is a group of new friends spending time together making music in Loveland. Mary Judd, the Co-Founder of Songwriting with Soldiers, says her organization aims to help veterans through the power of music. “We use the collaborative songwriting process to build creative connections and strengths,” Judd said. 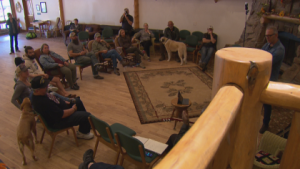 Songwriting With Soldiers sends veterans and songwriters on a weekend songwriting retreat, but it’s not just about making tunes. “One of the main goals of our program is to really, genuinely help create a bridge between the military and civilian communities,” Judd said. That creates an understanding of how America’s bravest might be feeling after coming home. Allison says being around other veterans and songwriters has helped her express herself in a way she hasn’t before. “I was able to be vulnerable with my creativity” she said. At the end of the weekend, the veterans will have professional recordings of a song they wrote and the group songs they all helped write. It’s an experience Jeramy would recommend for all veterans. Songwriting With Soldiers picks up the tab for all the veterans to attend the retreat except travel. If you would like to help them continue with their mission, you can make a donation at http://www.songwritingwithsoldiers.org/.